I got an post from Graham Marsden recently, regarding some architects’ drawings that he had rescued from a skip. His post is reproduced here in part. labelled Band Shed. Not sure if this was for band practice as Beulah Hall was next door in Beulah Street. Maybe some one else has further information if deemed useful. Drawing headed Openshaw Brewery Co ltd. Last info was that it was now a Tanning Salon. Condition good. The full post is on the Photo gallery page. The drawing is reproduced below. I don’t recall the land below Beulah St being a croft, I thought it was built up, but I don’t remember with what. I remember a croft further down Whitworth St, which had a shed producing firelighters, and also had the back entrance to the bookie’s house (Herbert Ellis?) where I used to take the occasional bet from my mother. Off course betting was illegal in those days. My brother also kept his car in a lock up garage on that croft. The conversion from earth closets to WCs was taking place generally in Openshaw at about this time, 1904. Openshaw was incorporated into Manchester in 1890 or thereabouts, and these improvements might have been as a result of incorporation. 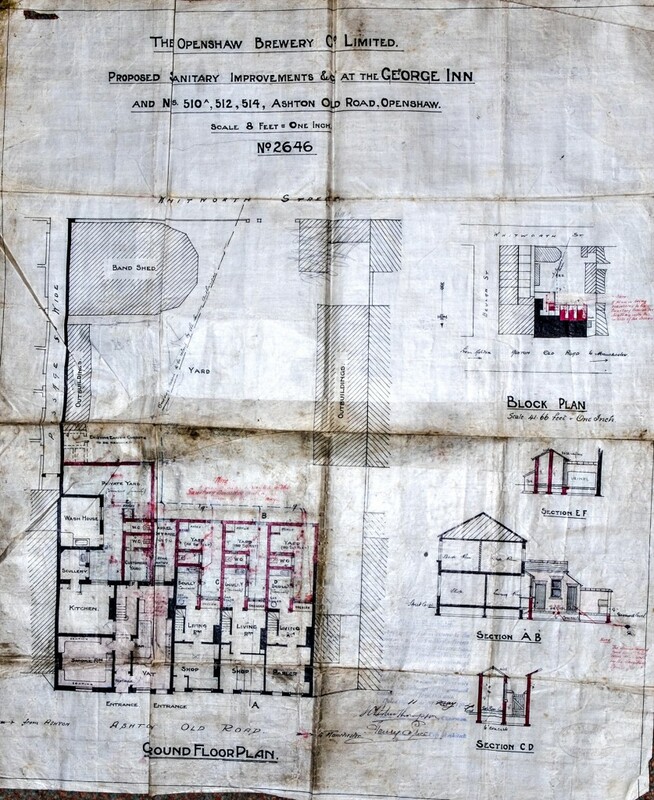 This drawing, together with two others that Graham rescued, of the Half Moon Inn in central Manchester, and an off licence in Withington, are now in the archives section of the Central Library. St. and another beyond Widnes St.(Wellie-bob St.). My dad took his bets their too. All the best, dave.